Pixar's Finding Dory comes thirteen years after Finding Nemo hit our screens and stole our hearts. Andrew Stanton returns to direct the new story, which begins one year after Nemo’s return when Dory suddenly begins to remember her parents. Desperate to find her family (despite struggling with short term memory loss), our favourite blue tang sets out on another epic journey - accompanied by friends, Marlin and Nemo. Finding Dory is an entertaining, funny and wonderfully satisfying sequel to Pixar's classic film, Finding Nemo. While, like many sequels, it doesn’t quite match up to the original, Finding Dory is e engaging, refreshingly sweet and avoids becoming overly sentimental. Oh and did I mention the cute? There is so much cute. Baby Dory is just utterly gorgeous. 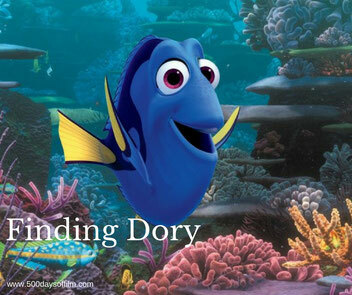 Superbly voiced once again by Ellen DeGeneres, Dory’s story is not just about finding her parents. It is also about the impact of her short term memory loss. Pixar handles this brilliantly. The film conveys the frightening nature of her condition so effectively - I really felt the pain of her struggle, particularly when facing the frustration of others. While her memory loss is sometimes used for comic effect, we never laugh at Dory - we are always on her side. The movie supports and celebrates Dory for who she is - always focusing on her strengths. It is lovely to see the return of so many beloved characters in Finding Dory. I couldn’t help but grin like a loon when Crush the turtle appeared and Mr Ray always makes me laugh. This may not be Nemo’s (voiced by Hayden Rolence) story but the little clown fish has plenty of screen time, still teaching his Dad, Marlin (the brilliant Albert Brooks), to relax and trust the abilities of others. In addition to the original characters, Finding Dory introduces us to a host of new faces. Many feel like instant Pixar classics. I loved Destiny the whale shark (voiced by Kaitlin Olson) and Ty Burrell’s Bailey the Beluga whale was hilarious. Meanwhile, the scenes featuring the two territorial sea lions, Fluke (Idris Elba) and Rudder (Dominic West), are great fun. 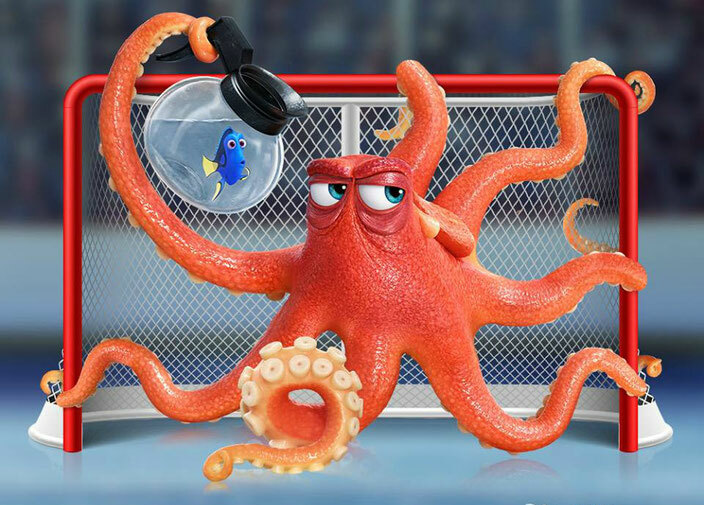 However, the best new character in Finding Dory is the scene stealing octopus, Hank. Wonderfully voiced by Ed O'Neill, Hank is just sublime. If Pixar is looking to complete a trilogy of ocean adventures, Hank’s story surely has to be the one to explore. While the 'look' of Finding Dory is similar to the Nemo original, the film displays plenty of new developments in animation. For example, the technology to create Hank just wasn’t available in 2003. Pixar spent years working on Hank alone. If you look at how an octopus moves, you can see why this character presented such a challenge. These creatures squish and squash their way around, unfurling and curling their tentacles. The animation studio had to find a way to recreate this movement in a wholly authentic manner. It took an engineer six months of research just to learn how to create the curve and motion of the octopus’s tentacles. Meanwhile, the scene when we first meet Hank took an incredible two years to complete. There is a reason why Pixar are head and shoulders above their competition - and his name is Hank. Finding Dory is a truly lovely film - heartwarming fun that is enjoyable for adults and children alike. Finding Dory was preceded by another gorgeous Pixar short. Called Piper, the film follows a baby Sandpiper bird and is just about the most gorgeous thing you will ever set eyes on. In addition, the photo realistic animation is incredible. The sea foam and the bird’s feathers are amazing. Soon we won’t be able to tell reality from a Pixar animation - apart from the big eyes of course! Finding Dory took £93.3m on its opening weekend in the US making it the most successful launch for an animated feature film in US box office history. While Finding Nemo had some genuine scares (thinking of Bruce and that Angler fish here), Finding Dory is pretty tame on the frights front. However, the film’s theme of being lost and separated from your family could be unsettling for some young children. Have you seen Finding Dory? If so, what did you think of Pixar’s latest film? Do let me know… leave me a comment in the box below!